Violette (Bushell) Szabo GC was a British Spy in World War II. 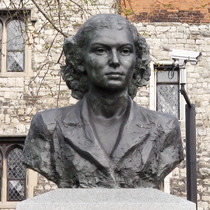 Violette (Bushell) Szabo GC was a Prisoner of War during World War II. 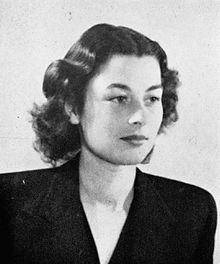 Violette Szabo was born Violette Reine Elizabeth Bushell in Paris on 26 June 1921. She was the second child of five and the only daughter of an English father Charles George Bushell and French mother Reine Blanche Leroy. The family moved to London, but because of the Great Depression, Violette and Dickie, her youngest brother, lived with their maternal aunt in northern France until the family was reunited in south London when Violette was eleven. Violette was a very active who enjoyed gymnastics, bicycling, and ice-skating with four brothers and cousins. Violette was often regarded as a tomboy, especially because she was taught by her father to be a good shot with a gun. Besides being able to speak English, she was fluent in French. She left school at the age of 14 and started to work as a hairdresser’s assistant. After this job, she worked at the Oxford Street branch of Woolworth’s as a sales assistant. At the outbreak of the Second World War, she was working at Le Bon Marché, a Brixton department store. After spending a week together while Étienne was on leave in the summer of 1941, Violette found out that she was pregnant and left the Auxiliary Territorial Service. On 8 June 1942, she gave birth to Tania, the couple’s only child. However, in a tragic turn of events, Étienne was killed at the Second Battle of El Alamein on 24 October 1942. Violette now faced an uncertain future as a war window and single mother. At the time of being notified of Étienne’s death Violette was working at the South Morden aircraft factory with her father. There is no known reason for why Violette was recruited by the SOE. Some suggest it was because of her enlistment in the ATS and other contributions to the war efforts. After meeting with “Mr. 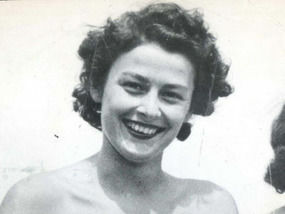 E. Potter”, Violette was given security clearance on 1 July 1943 and selected for training as a field agent on 10 July. She was commissioned as a section leader in the First Aid Nursing Yeomanry (the FANYs), a civilian service often used by SOE as a cover for female agents. Prior to being assigned to a specific training Violette received an assessment to check her fluency in French and a series of interviews. Then again in June, Violette was scheduled for a second mission to return to France. However, due to weather the mission was delayed several times. On June 7, 1944, the day after Allied forces stormed the beaches of Normandy, Szabo was dropped back into France to disrupt German communications. Once the weather improved and the mission scheduled, Violette and three colleagues were dropped by parachute from a USAAF Liberator (B-24) flown from RAF Harrington onto a landing field near Sussac on the outskirts of Limoges. They quickly established contact with the French Resistance and started disrupting German communications. Violette Szabo was executed in the execution alley at Ravensbrück, aged twenty-three, on or before 5 February 1945. She was shot in the back of the head while kneeling down, by SS-Rottenführer Schult in the presence of camp commandant Fritz Suhren, who pronounced the death penalty, camp overseer and deputy commandant Johann Schwarzhuber (de), SS-Scharführer Zappe, SS-Rottenführer Schenk (responsible for the crematorium), chief camp doctor Dr Trommer and dentist Dr Hellinger, from the deposition of Schwarzhüber recorded by Vera Atkins 13 March 1946. Denise Bloch and Lilian Rolfe—neither of whom could walk and were carried on stretchers—were shot at the same time, by order of the highest Nazi authorities; the bodies were disposed of in the camp crematorium. 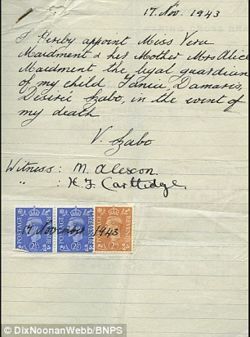 While there is some confusion about the precise circumstances of her execution, Violette Szabo, along with her male and female colleagues who died in the concentration camps, is recorded by the War Office as having been killed in action. It must be noted that as an agent dressed in civilian clothes operating behind enemy lines, Violette Szabo was regarded by the Germans as a Franc-tireur not protected by the Geneva Convention and liable to summary execution. Though she was treated harshly at Ravensbrück, there is no conclusive proof that she was tortured or sexually assaulted by the Germans; her biographer, Susan Ottaway, thinks it unlikely, although the threat of both must have been ever-present. Lieutenant (F.A.N.Y.) Violette Szabo volunteered in early 1944 to undertake a particularly dangerous mission in France. This consisted in investigating a report that one of our secret organisations previously established in Rouen and Le Havre had been broken up by the Gestapo, and, if this report proved accurate, to establish contact with any elements remaining uncontaminated. It was evident to Szabo that such work called for a particularly high degree of courage and finesse, but she undertook the task with enthusiasm and in her execution of the delicate researches entailed showed great presence of mind and astuteness. She was twice arrested by the German security authorities, but each time managed to get away by ruse. In April 1944 she, together with other members of her group, was surrounded by the Gestapo in a house in the South-West of France. Resistance appeared hopeless, but Szabo, seizing a Sten-gun and as much ammunition as she could carry, determined to try and hold out, in the hope that help might come. She barricaded herself in part of the house and, exchanging shot for shot with the enemy, killed or wounded several of them. By constant movement, she avoided being cornered and went on firing until she dropped exhausted after several hours, her ammunition expended. 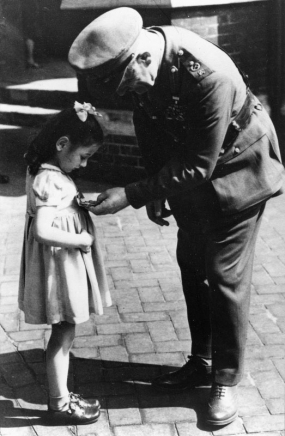 The German commander paid tribute to her courage. She was taken off in captivity and had to endure solitary confinement and the torture of the cold shower and others. 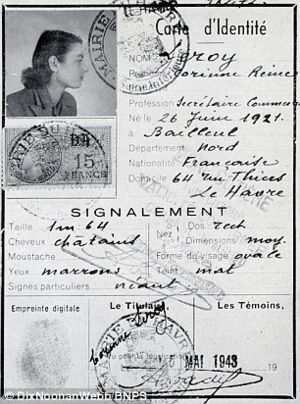 When she was moved from France to Germany, she traveled by train, in which several other captured members of this department were being conveyed to concentration camps. Szabo knew by sight some of these men, who were in a cattle truck at the far end of the train. Between Chalons and Marne [?] the train was heavily attacked by the R.A.F. The German guards having secured the prisoners and locked the train, left the track to go to shelter. Szabo, taking a pannikin of water, crawled on all fours (her hands were manacled) up the entire length of the corridor of the train to bring water and comfort to the officers she knew. Her action raised morale incalculably and was instrumental in encouraging many of these officers to continue resistance. Although Szabo was continuously and atrociously tortured she never by word or deed gave away any of her acquaintances or told the enemy anything of any value. She showed great courage in exhorting other women prisoners to be of good cheer and walked proudly to the gas chamber, knowing full well the fate that was in store for her. She gave a magnificent example of courage and steadfastness to all that had the honour to know her. In December 1946, it was announced that Violette had been posthumously awarded the George Cross. Her daughter Tania, wearing the dress her mother had bought her in Paris, attended Buckingham Palace to receive the award from George VI. 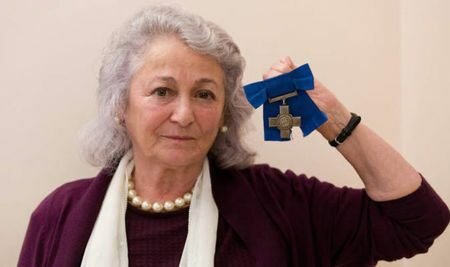 Violette Szabo was awarded her George Cross posthumously on 17 December 1946, it was presented to her daughter Tania Szabo by King George VI. Her daughter Tania, wearing the dress her mother had bought her in Paris, attended Buckingham Palace to receive the award from George VI. "Madame Szabo volunteered to undertake a particularly dangerous mission in France. She was parachuted into France in April, 1944, and undertook the task with enthusiasm. In her execution of the delicate researches entailed she showed great presence of mind and astuteness. She was twice arrested by the German security authorities but each time managed to get away. Eventually, however, with other members of her group, she was surrounded by the Gestapo in a house in the south-west of France. Resistance appeared hopeless but Madame Szabo, seizing a Sten-gun and as much ammunition as she could carry, barricaded herself in part of the house and, exchanging shot for shot with the enemy, killed or wounded several of them. By constant movement, she avoided being cornered and fought until she dropped exhausted. She was arrested and had to undergo solitary confinement. She was then continuously and atrociously tortured but never by word or deed gave away any of her acquaintances or told the enemy anything of any value. She was ultimately executed. Madame Szabo gave a magnificent example of courage and steadfastness." 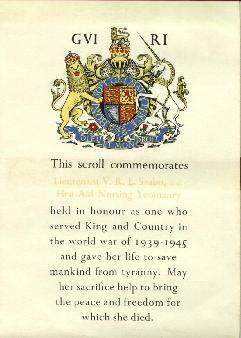 This scroll came to Tania in Stockwell in a large hardback brown envelope on His Majesty's Service. Violette's name is not very clear but it reads Lieutenant V.R.E. Szabo, GC, First Aid Nursing Yeomanry (F.A.N.Y.). 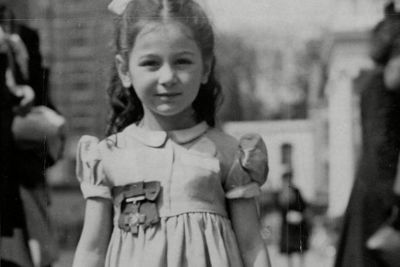 Violette Szabo was also awarded the Croix de guerre avec etoile de bronze was awarded by the French government in 1947 and the Médaille de la Résistance in 1973. As one of the SOE agents who died for the liberation of France. Violette’s parents did not have a full understanding of the nature of the type of work she was doing in the military until one day her mother found the jump wings Violette had earned. They had accidently fallen out of a bag or pocket of Violette’s when she was packing to return for duty. There are numerous World War II museums in the United Kingdom, each has its own story to tell about the war. The most significant ones are the Imperial War Museums, they have the largest collection of Victoria Crosses in the Lord Ashcroft Gallery: Extraordinary Heroes display. This is also the location of Violette Szabo’s items purchased at auction in 2015. Besides the Imperial War Museum, there is a separate museum located at the former house Violette spent many happy childhood days and did indeed stay between her missions to France during the war. Violette's aunt moved to the house and subsequently turned it into the Violette Szabo GC Museum. The museum was opened in 2000 and is located in Herefordshire, for more information click here. 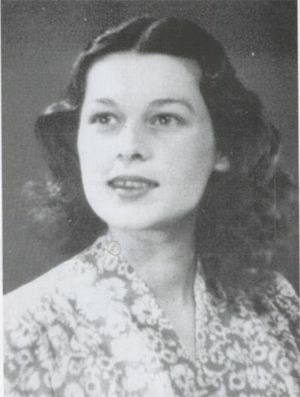 Below are links to just a couple of the many videos about Violette Szabo’s life in the Special Operations Executive (SOE). The videos include additional information about the George Cross Medal presented to Tania Szabo by King George VI. 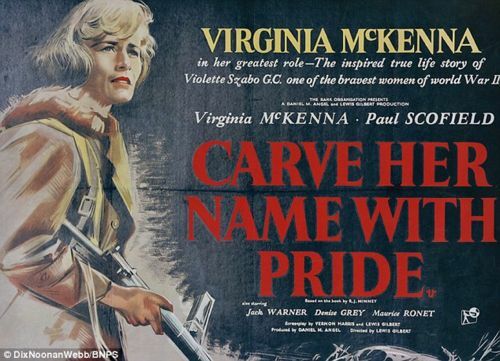 There was a movie made about the exploits of Violette Szabo during World War II, Virginia McKenna played the role of Violette Szabo in the film Carve Her Name with Pride. The film was released in June 1958. To view a scene for the movie Carve Her Name with Pride, click here. If you are unable to find a copy of the full movie you can click here to view or download the full movie, the viewing time is approximately 2:00 hours. 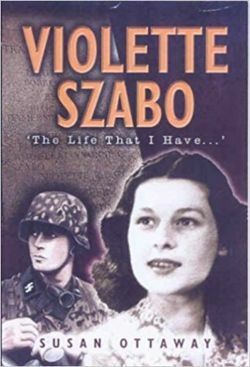 Below is a list of books written about Vioilette Szabo and her life leading up to the time she spent in the SOE and her tragic death. The list includes the book titles and authors. ↑ "England and Wales Marriage Registration Index, 1837-2005," database, FamilySearch (https://familysearch.org/ark:/61903/1:1:QV82-4HGQ : 8 October 2014), Violette R E Bushell and null, 1940; from “England & Wales Marriages, 1837-2005,” database, findmypast (http://www.findmypast.com : 2012); citing 1940, quarter 3, vol. 2C, p. 1018, Aldershot, Hampshire, England, General Register Office, Southport, England. ↑ King, Gilbert. “Behind Enemy Lines With Violette Szabo.” Smithsonian.com, 6 Dec. 2011, www.smithsonianmag.com/history/behind-enemy-lines-with-violette-szabo-1896571/. Accessed 18 Aug. 2017. ↑ Who Was Violette Szabo? Imperial War Museums, www.iwm.org.uk/history/who-was-violette-szabo. Accessed 18 Aug. 2017. ↑ “Violette Reine Elizabeth Szabo.” WW2 Awards.Com, en.ww2awards.com/person/545. Accessed 16 Aug. 2017. ↑ Zsabo, Tania. “Violette Szabó, George Cross.” Violette Szabó, George Cross, www.violetteszabo.org/eventsandnews.html. Accessed 19 Aug. 2017. 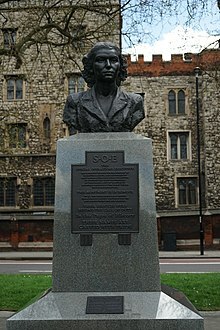 ↑ “Bust: Violette Szabo & SOE.” London Remembers, www.londonremembers.com/memorials/violette-szabo-soe. Accessed 19 Aug. 2017. ↑ Find A Grave, database and images (https://www.findagrave.com : accessed 25 December 2018), memorial page for Violette Reine Elizabeth Bushell Szabo (26 Jun 1921–c.5 Feb 1945), Find A Grave: Memorial #13127738, citing Brookwood Military Cemetery, Brookwood, Woking Borough, Surrey, England ; Maintained by Find A Grave Cremated, Other. ↑ “The history of a real life heroine.” The Violette Szabo Museum, www.violette-szabo-museum.co.uk/foyer.htm. Accessed 19 Aug. 2017. No known carriers of Violette's mitochondrial DNA have taken an mtDNA test and no	close relatives have taken a 23andMe, AncestryDNA, or Family Tree DNA "Family Finder" test.